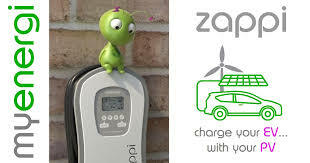 Zappi is an electric vehicle charge point with special charging modes to allow your solar or wind turbine system to charge your car. 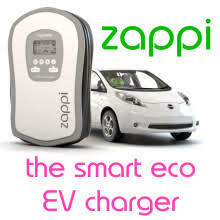 Zappi works as a standard electric vehicle charger if you don't have solar PV - if and when you do decide to fit panels, then Zappi can be connected to them to allow excess power to be diverted to the car charger. 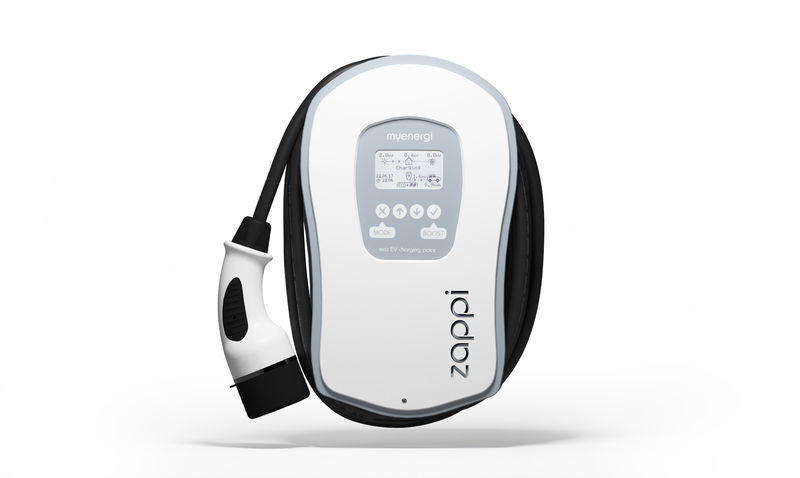 The Zappi, an intelligent electric vehicle charger is the only one of its kind on the market. In short, it enables you to charge your electric car with surplus electricity produced by your solar PV or wind turbine, maximising your returns rather than exporting back to the grid for a lower than market price return. Solar and wind are intermittent, and sometimes there’s a glut. The Zappi helps you make use of that glut. As distributed energy sources like solar get more popular, many homeowners will have times when they are producing more energy than they can realistically use. Often, they can sell that energy to the grid—but that’s much less lucrative or efficient than using it yourself. One way to solve this is using hot water as solar storage, and another, of course, is home battery storage. But for people who are already driving an electric or plug-in hybrid car, the first place to look might be your own driveway or garage. Zappi is an electric vehicle charging station that was initially launched through a successful crowdfunding campaign, and is now in actual production. It communicates with both your car and your home to maximize the amount of charge you’re getting from on-site solar or wind. In fact, if you tell it to, it will only charge using excess solar or wind—whatever is not being used by your house—at whatever rate it can. That means, on sunny or windy days when you don’t have to go anywhere, you can simply ask Zappi to soak up excess production and you’ll be driving on free, green energy that you’d otherwise have had to sell. 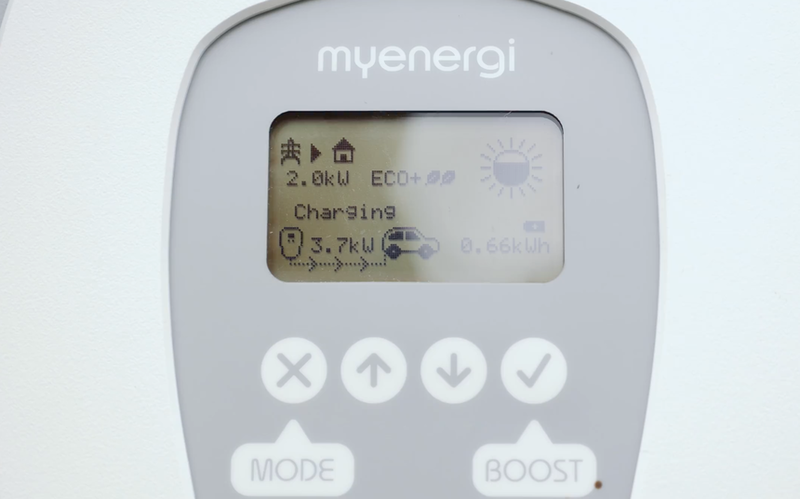 Zappi is the brainchild of MyEnergi, a company whose explicit mission is to encourage more self-consumption of green energy. The Zappi has 3 charge modes, the cleverest being the ECO & ECO+ modes, which maximise the effectiveness of your micro generation system. You can charge your car with surplus energy, enjoy a full graphic display, and view listings of your savings from date of installation. In the ECO mode, only the domestically generated renewable energy is used. 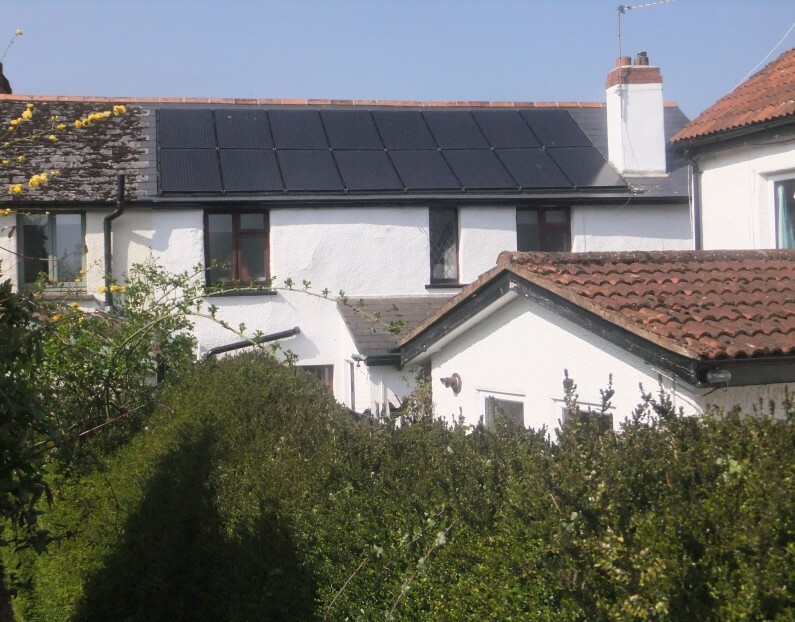 The house is the priority destination when there is a demand for energy, however when there is little or no demand in the house, the energy then diverts back to the Zappi to charge your Electric Vehicle. 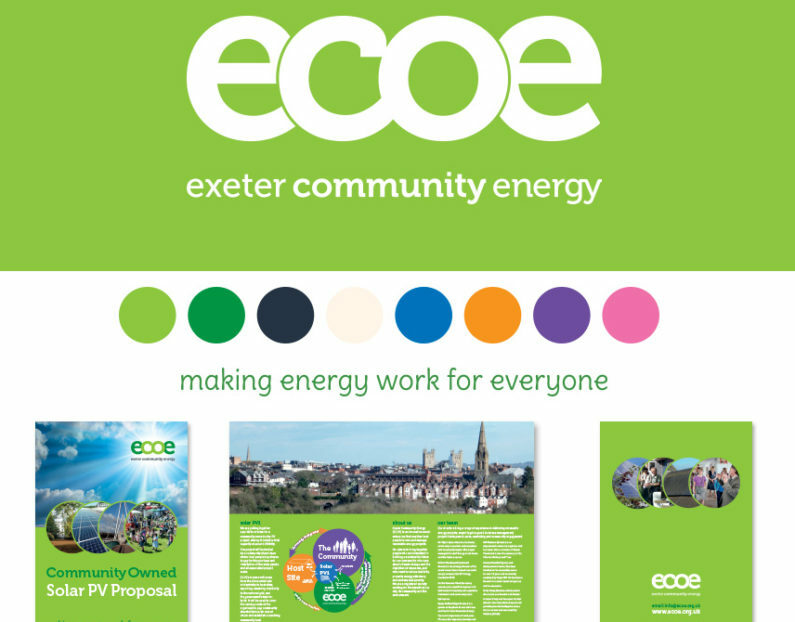 In the ECO+ mode, the full amount of renewable energy generated is used, however if additional demand is desired it may be imported at any time. It will however restrict the amount imported, pausing if there is too much imported as pre-determined by the consumer. In Fast mode, the maximum surplus energy from the PV or turbine will be used, with the remainder of the energy being imported to provide maximum power with no restriction. Works with Type 1 (Leaf) and Type 2 (Tesla), and the Renault Zoe. If you don’t yet have solar panels or a wind turbine, Zappi can work like any other EV charger in fast mode, so if you do get a micro generation system installed you’re ready to go! 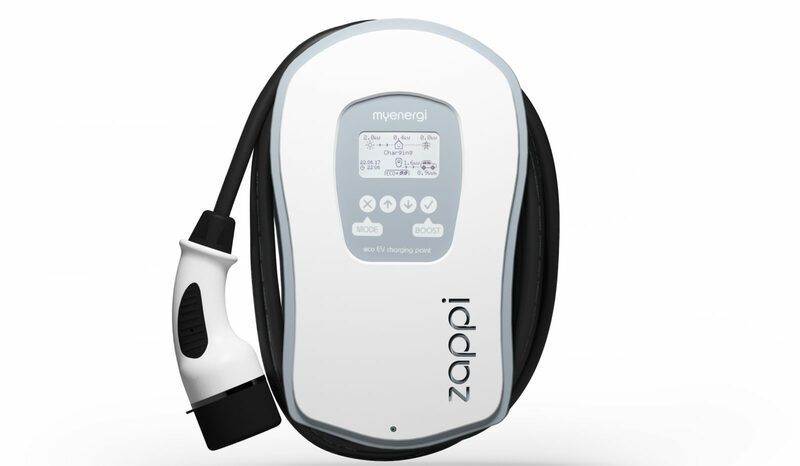 An OLEV-approved product, zappi is available to be fully installed with a £500 Electric Vehicle Homecharge Scheme grant. It can charge EVs using load-balancing technology, reducing power to the car when the house has a high electrical load, before then topping-up the plug-in car on economy rates. The truly green way of motoring!